There's a lot of buzz around the holidays already - people are talking about shopping for gifts, making goodies and putting up the Christmas tree. It's exciting, for sure. But the holiday season also comes with a lot of stress. It's a bit of a whirlwind. There are so many tasks to manage and maybe you're preparing your home for company or worrying about spending time with people who stress you out. Cold and flu season is also ahead and all the time spent indoors in close proximity to other people increases the possibility of viruses spreading. All of this sounds dismal, and I don't mean to take the fun out of the holidays. I just want to be conscious that we need to balance the excitement of the holiday season with the need to stay healthy during late fall and winter. Now is a great time to reduce stress as much as possible and provide appropriate care for yourself and your body. One easy way to do this is to drink lots of fluids, like water and herbal tea. Add good sources of fibre to your diet and eat plenty of fruits and vegetables. Which brings me (finally) to this tasty and healthful juice/smoothie combo. I don't take out my juicer as often as I should, but I'm always happy when I make the effort to use it. I also don't eat grapefruit often. I remember my parents regularly had grapefruit for breakfast when I was growing up. They would cut the grapefruit in half, sprinkle sugar over the halves and scoop out the fruit with a spoon. One of the lowest calorie fruits, grapefruit has long been associated with dieting and losing weight. 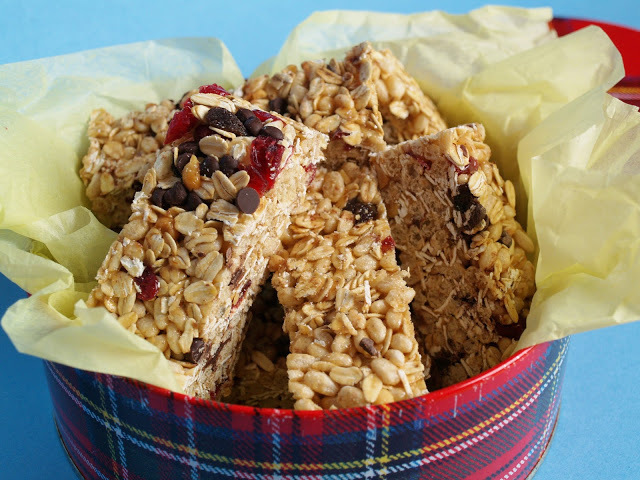 It has a decent amount of fibre, so it can help you feel full longer. Grapefruit also offers plenty of nutritional benefits, providing a good amount of vitamins, antioxidants and minerals. It has a high content of vitamin C, important in winter as vitamin C is thought to help you recover more quickly from colds. Of course, when you juice grapefruit, you won't get all the fibre, but you'll still get the benefit of vitamins, antioxidants, minerals and high water content for good hydration. Grapefruit contains ingredients that inhibit an enzyme used to metabolize certain medications, so check for medicine interactions before eating grapefruit. 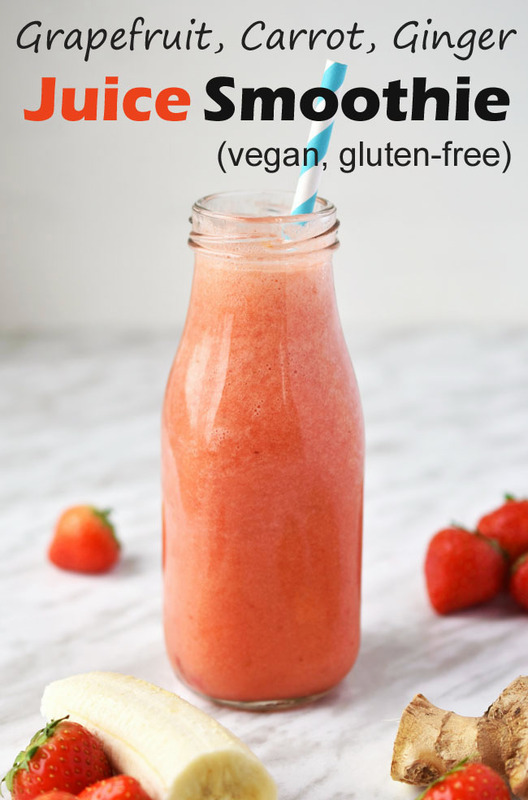 You might well wonder why my photos have strawberries and bananas in them when the title reads, "Grapefruit, Carrot, Ginger Juice Smoothie." I feel like the bitterness of grapefruit makes it a love it or hate it kind of fruit. But I think you can grow to love it too. 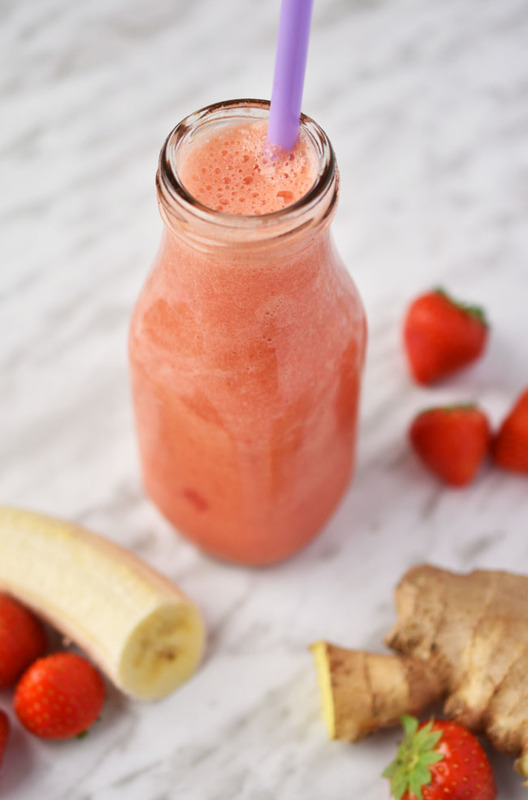 So I took the beautifully hued juice of grapefruit, carrot and ginger root and turned it into a pleasant smoothie, with creamy banana and delicious, sweet frozen strawberries. You could use fresh strawberries too, and just add ice to cool the smoothie some. Unless you like warm smoothies, of course. When you peel the grapefruit, be sure to remove the pith (the white outer layer on the fruit) as much as possible to reduce some of the bitterness. This Grapefruit, Carrot, Ginger Juice Smoothie makes a healthy start to the day. It would also be a nice afternoon pick-me-up. Ginger adds a pleasant heat and contains gingerol, which has powerful antioxidant and anti-inflammatory effects. The carrot is a sweet touch, as well as contributing more vitamins and minerals, especially vitamin A. The bananas and strawberries are not only delicious, but also strong contributors to good health. 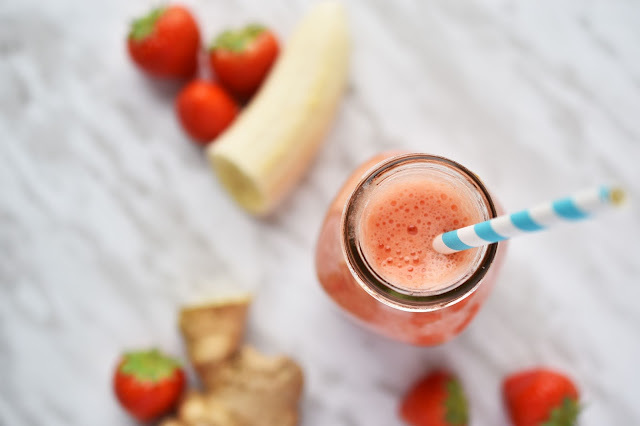 This smoothie recipe is completely made up of whole, natural foods. So let's not wait for the new year to start making our favourite juices and smoothies! If we build on our healthy eating habits right now, we'll enter the holiday season stronger and more prepared to ward off colds and flus. And we'll feel justified as we indulge in a few treats. Because you know that's gotta happen. Do you use your juicer regularly? Do you even have a juicer? Do you eat grapefruit often? Run the grapefruit, carrot and ginger through a juicer. Pour juice into blender. 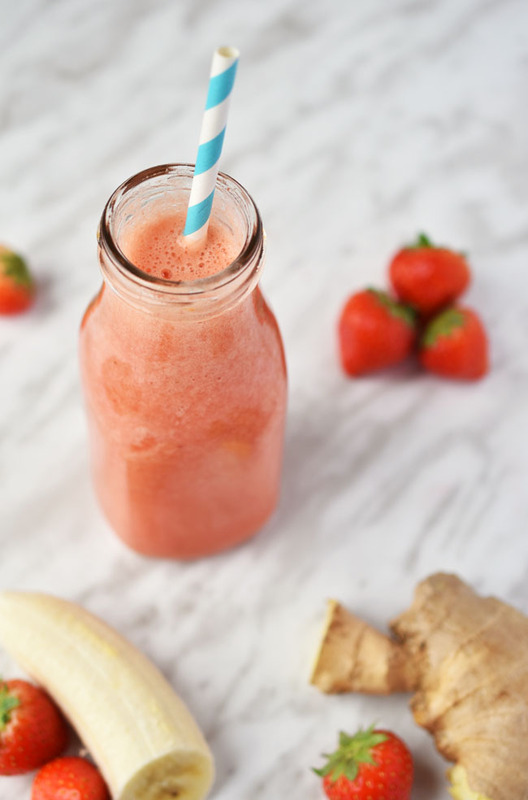 Add banana and strawberries. Blend until smooth.